Babs Young writes: Flowers seem to be coming a bit earlier this year, but Mama Nature does not disappoint with her colors. Beautiful. I like the flat lighting, too. Thank you, Martha. It’s a Michigan specialty. Ooh, that’s beautiful! Time for a new screensaver. We are going to have to put you on staff. I like the raindrops, too. And that’s quite an “uptown” flower. Our daylilies don’t quite compare, although a ditchful of them, or a sweep of them marching across a front yard, can be pretty impressive. Lovely photo. Well to hear the denizens of Blue Heaven tell it, they are the very definition of uptown over there on the western shore of Torch Lake. They even sport t-shirts that claim “The West Side is the Best Side.” Rumor has it that the folks over in Alden are working on some rather elegant sportshirts with a tasteful “The East Side Demurs” in script. The Cowboy says it all tastes the same to him. I was afraid of that. But I went into denial. I really wanted to use the title. Our day lillies are barely budding here in Nova Scotia, right now. We need some warmer weather to bring them along. Love Babs’ photo. May you have just the right amount of warmth. We are having a little extra just now. Perhaps I can arrange to send some of it to you. Somehow with the raindrops it looks exotic. I wonder if it smelled as beautiful as it looks. Perhaps I can find out. I like fragrant flowers. So similar to the ones that used to grow in my grandparents’ yard. They were my first encounter with lilies. I was always fascinated with their dark burgundy pollen which came off easily when touched. Yesterday I brought some yellow day lilies from the yard into the house. Their scent is heavenly. I can’t remember if the tiger lilies are scented. 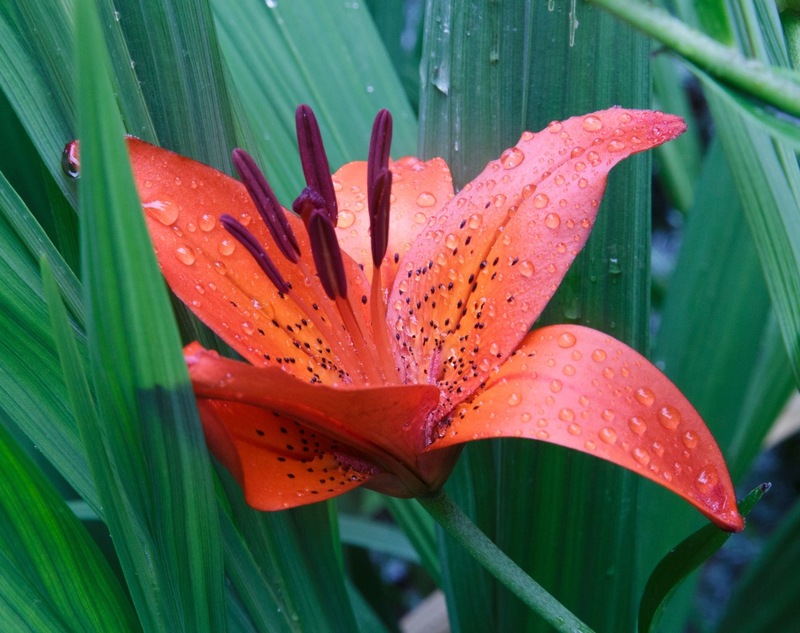 I don’t know where these particular lilies are – must ask Babs. She’ll know whether they’re fragrant or not. Flowers are really good at triggering memoies, aren’t they!